Hayden was so excited when he woke up this morning because he new we were visiting a potential preschool. We walk Layla to school everyday and he tells me he can't wait to go back to school. H.C. reminded Gary bright and early this morning. "Daddy I am going to meet my new teachers today!" We liked the school and Hayden was so happy to be around other kids. 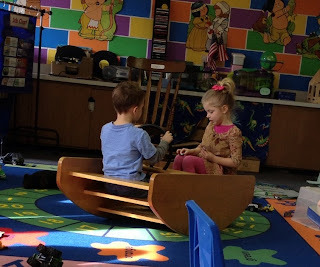 The school is very different from our preschool in Texas, but it is small and really cozy. Our neighbor attends this preschool and she was thrilled to have her new friend in her school. It was the cutest thing. She held Hayden's hand and showed him all around. He was blushing, but he was happy to have her attention. My heart melted just a little bit! Here they are...Hayden is driving her around in their car! I'm glad we found a school we both like for now. I'm ready for Hayden to feel at home at his new school here in Ohio and I'm hoping this school can get him in shape to start kindergarten in the fall of 2013! He looks adorable! So glad y'all are starting to get into a routine & feeling at home. Hi i am normally a quiet reader but you now live in my state of OHIO :) it is important that the preschool has a good prep for school as my schools have a zero tolerance policy and expect a lot out of kindergarteners. I live in North East OH about 40 min outside of Cleveland. Where abouts are you? OH has a lot to offer. If you ever need any suggestions feel free to email me! I'm so happy that things are settling in for you guys.